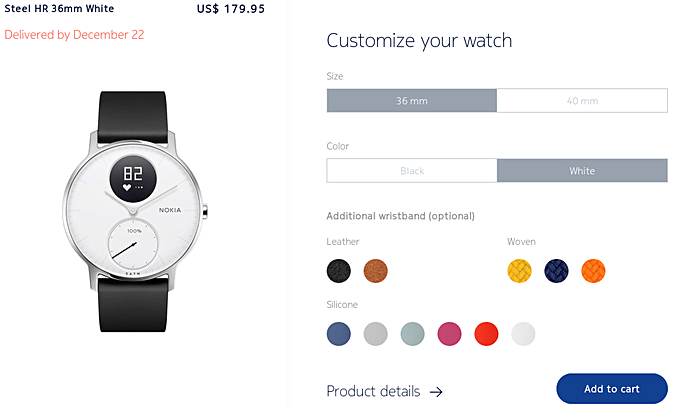 The Nokia Steel HR, which has been available to pre-order since last month, is now available for purchase in the United States. A quick look at the Finnish company's US website reveals both 36mm and 40mm variants are on sale. The 40mm model is only available in black, while the other one is available in white as well. Shipments for the 36mm, black variant will begin in 2-3 weeks, while all other models will be released on December 22. Pricing starts at $180 and goes up to $200 depending on the variant you purchase. For more info, head to the Source link below. If you are unsure whether you should get one or not, you should check out our review to know more about the hybrid smartwatch. So when will reach Malaysia? Xiaomi/Huami Amazfit Bip is way better.